In this innovative book, Stephen P. Rice offers a new understanding of class formation in America during the several decades before the Civil War. This was the period in the nation's early industrial development when travel by steamboat became commonplace, when the railroad altered concepts of space and time, and when Americans experienced the beginnings of factory production. These disorienting changes raised a host of questions about what machinery would accomplish. Would it promote equality or widen the distance between rich and poor? 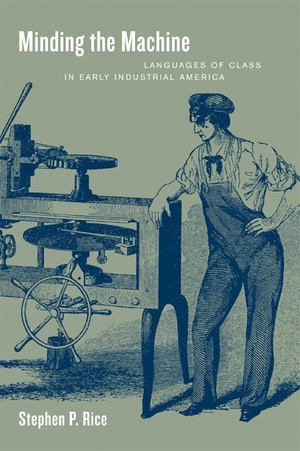 Among the most contentious questions were those focusing on the social consequences of mechanization: while machine enthusiasts touted the extent to which machines would free workers from toil, others pointed out that people needed to tend machines, and that that work was fundamentally degrading and exploitative. Minding the Machine shows how members of a new middle class laid claim to their social authority and minimized the potential for class conflict by playing out class relations on less contested social and technical terrains. As they did so, they defined relations between shopowners—and the overseers, foremen, or managers they employed—and wage workers as analogous to relations between head and hand, between mind and body, and between human and machine. Rice presents fascinating discussions of the mechanics' institute movement, the manual labor school movement, popular physiology reformers, and efforts to solve the seemingly intractable problem of steam boiler explosions. His eloquent narrative demonstrates that class is as much about the comprehension of social relations as it is about the making of social relations, and that class formation needs to be understood not only as a social struggle but as a conceptual struggle. Stephen P. Rice is Associate Professor of American Studies at Ramapo College of New Jersey.